What a beautiful day on the water, the sun was shining and the waters were calm! Although there is only eleven days left of our season, the whale encounters have not slowed down! Throughout the day we encountered several groups of Biggs Orca. These mammal eaters were spotted west of Victoria in the Juan de Fuca Strait. Both groups were seen searching for and taking down their morning snacks. As a group the pod works together to corral and trap their prey, before sharing it as a family. The humpback whales have been stealing the show lately! They have been seen lunging out of the water to trap small bait fish at the surface and into their mouths. Its incredible to see a large animal propel itself out of the water with ease! A dreary day in the capital city, with rain and grey skies we are lucky most of our vessels include a heated cabin! In the morning BC Luna headed out with no reports yet, so the captain headed east to scan the area for whale blows. It didn’t take long before a group was picked up in the San Juan Islands, so we went for it and became the only vessel on scene with orcas yesterday morning! On the way back Captain Gordon spotted another Biggs Orca (mammal eaters) group a lot closer to Victoria, good eye Gordon!!! In the afternoon BC Orca set out to reacquired the pod and encounter them as they scan the area for potential prey. They ended up right off the waterfront of Oak Bay! It was a very sunny and calm day in the Victoria area, a complete 180 from the previous day. We are coming to the end of the season but the whale encounters have yet to slow down! In the morning our fleet encountered several humpback whales west of Victoria, one was particularly friendly and ‘mugged’ one of our vessels. This means that the individual approached and scratched its back on the haul while checking out the passengers, a rare and lucky encounter. Of course the engines were shut off and the captain waited for the whale to lose interest. The whales are not aware of the strict 100 m approach limit and sometimes its tough to keep them away from the boat! 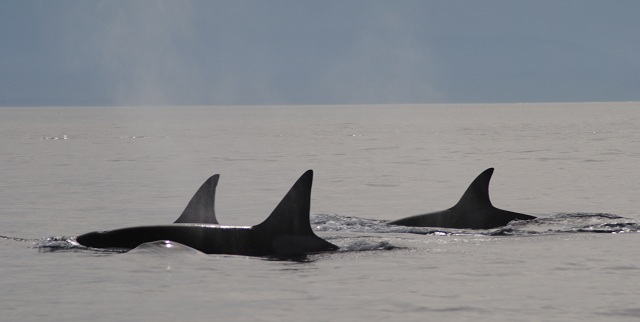 In the afternoon a group of Biggs orcas (mammal eaters) were picked up in the Georgia Strait. They were travelling North as they scanned the area for their latest prey item. They went right by the Schwartz bay Ferry terminal and into the Saanich Inlet, cool! The Thanksgiving weekend has arrived! Although it is late in the season and the rainy days are becoming more frequent, there are still plenty of whales in the area! Biggs Orca (mammal eaters) were encountered West of Victoria in Whirl Bay. While on scene there were several seals in the water coming in close to use the boat as a safety zone. Time flies when everyday on the Salish Sea is a blast! We cannot believe that it is October already and our 2018 season is coming to an end. Yesterdays skies were clear and sunny with low winds, making the conditions ideal for whale watching. Biggs orca (mammal eaters) were picked up by Race Rocks Ecological Reserve before our fleet left the dock for the day. They were identified as the T123’s and were seen with a brand new calf, that is very exciting to see! Humpback whales are still around gorging themselves on zooplankton and small bait fish to built up enough blubber for their migration to southern waters, it wont be long now before they are gone! September is coming to a close, with one day left of the month. There was a strong northern wind so our fleet went west and encountered many humpback whales! They are still here feeding in the Juan de Fuca Strait shifting with the tides. The large aggregation of baleen whales are gorging themselves before they take off for warmer southern waters for the winter. Race Rocks Ecological Reserve is full of seals and sea lions relaxing on the rocks edge. Below is a rich kelp forest that the local sea otter wraps himself for a nap! The sun was shining and the waters were calm as the fleet headed out. Reports of orca and humpback whales came in early so we were excited to get out there! Whales were everywhere (yet again! ), in the morning the fleet went West to encounter the southern residents. They were seen fishing in the middle of the Juan de Fuca Strait, spread out through a channel corralling their next catch. We hope they are finding enough prey to sustain the energy needed to thrive! The mammal eating Biggs orca were also out west, seen snacking on their latest meal. This orca ecotype spend about 80% of their time hunting in order to sustain their thick blubber layer. Humpback whales are still around foraging on microscopic zooplankton that is abundant in our waters. it wont be long before they begin to migrate back down to tropical waters for the winter. Lots of seals and Sea Lions can be seen relaxing along the shoreline of Race Rocks Ecological Reserve. Often heard barking at one another as they compete for space. Another lovely day in the Capital region! We are happy to see the sun continue to shine with calm waters are sticking around late into September. Our season is coming to a close in a few weeks but the whale action has yet to slow down. The mammal eating Biggs orca have been frequenting the area all month, often seen in groups travelling through or hunting. This ecotype of orca remain quiet and work together to heard their prey items and always share their catch. Humpback whales are still here feeding before leaving to tropical waters for breeding and calving. There has been a loose aggregation of them in the Juan de Fuca Strait following the tides as it pushes the zooplankton.